Psychologist, Historian of Science Michael Shermer Welcomed to Speak on "Good and Evil"
Nova Southeastern University was pleased to welcome psychologist and historian of science Michael Shermer, Ph.D. on Thursday, April 6, 2006 at 7:00 p.m. in the Alvin Sherman Library, Room 4009. 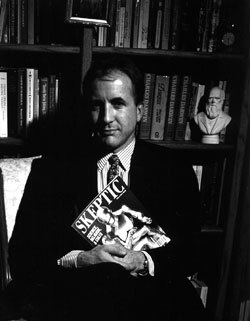 Michael Shermer is the director of the Skeptics Society, a monthly columnist for Scientific American, the host of the Skeptics Lecture Series at the California Institute of Technology, and the co-host and producer of the 13-hour Fox Family television series, Exploring the Unknown. He is the author of many books-The Borderlands of Science, about the fuzzy area between science and pseudoscience; Denying History, on Holocaust denial and other forms of historical distortion; and most recently, The Science of Good and Evil. Is it in our nature to be moral, immoral, or amoral? If we evolved by natural forces, then what was the natural purpose of morality? If we live in a determined universe, then how can we make free moral choices? Does evil exist, and if so, what is the nature of evil? Is there justice in the world beyond the social order? If there is no outside source to validate moral principles, does anything go?